As a food editor I spend hours studying current food trends — which foods are the new superstars, how people are eating today vs. yesterday, and so on. Of course, not every trend is surprising. We all know that people are cutting back on what they spend these days so everyone is looking for creative, fun ways to cook inventive, delicious meals for less. Tonight I applied that same principle to what I was cooking for Mason. How could I take just a few organic ingredients and come up with several different yummy purees that were simple and nutritious? For starters, I surveyed what we had on hand. The three organic sweet potatoes on the counter looked good. We had four organic Gala apples fresh from the, um, grocery store. Chicken was already thawed in the fridge so that was in. A solid, six-month-old-friendly protein. A hearty winter veggie. And a versatile fruit. I was set. 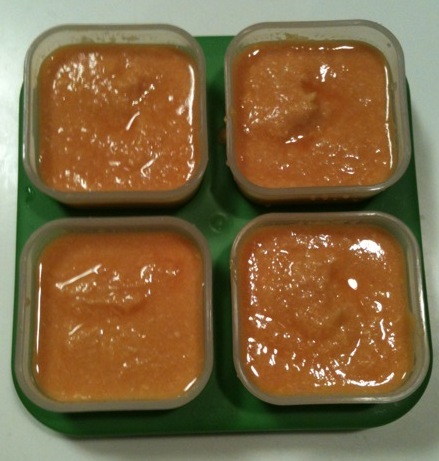 The first puree that I made was a no-brainer — I’ve made it before, and it’s super easy: Chicken and Sweet Potatoes. Next I thought about the combination of food my hubby and I like to eat. We like texture, contrasting flavors, fresh seasonal fruits and veggies. 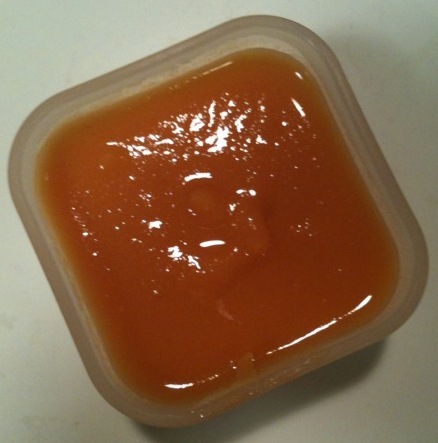 So I decided to add a little apple to the mix to create Chicken-Sweet Potato-Apple Puree. When combined, the apple added sweetness to the mix, while the sweet potato was smooth and mellow. And the chicken fit right in. Mason hasn’t tried this little number yet, but I assume he’ll like it. After all, he likes the three ingredients alone. From there I moved on to classic Sweet Potatoes and Apple. I wanted a blend that would be a lovely balance of fruit and veggie. It would end my daily debate about whether Mason was getting an equal balance of the two, and there’s something so scrumptious about sweet potatoes topped with warmly spiced fall fruit. Mason’s variation wasn’t spiced, but it was equally good. I loved that it blended into a rich orange color– I used a bit more sweet potato than apple simply because that’s what I had on hand. Normally I’d do an equal balance of the two. I loved that the mixture was smooth and easy, with just a hint of sweetness. I loved that it was packed with beta carotene, vitamin C, and lots of other good stuff. Three purees down but with some chicken left, I pulled out a couple of jars of carrot from the cupboard (remember, carrots have a high nitrate content so you shouldn’t make them on your own) and mixed up a Chicken and Carrot blend. Plain, straightforward, nutritious. Mason won’t complain. 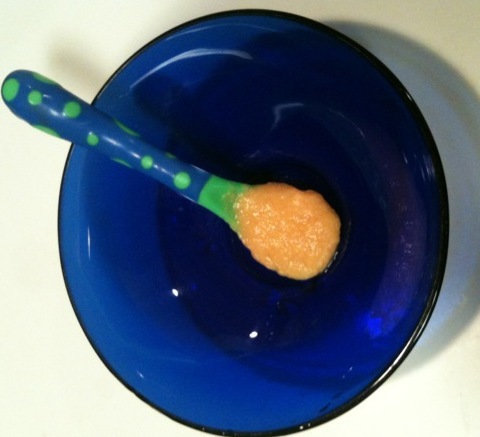 He enjoys this combo, although it certainly doesn’t have the pizazz that the Chicken-Sweet Potato-Apple Puree does. Not a bad night of cooking — and I ended up with 25 servings of baby food for about $12, including the carrots. How do you make the most of your kitchen staples when making your babe his/her food? 1. Poach chicken for about 35 minutes. Drain and rinse thoroughly with cold water. Shred a cup’s worth, and set aside. 2. Steam 1-2 diced apples, depending on size, for about 15 minutes or until soft. Drain and rinse with cold water. Set aside 1/2 cup. 3. Steam a sweet potato for about 15 minutes or until soft. Drain and rinse with cold water. Set aside 1/2 cup. 4. Combine all three ingredients in a food processor or blender. Add cooking liquid or water until you reach your desired consistency. (Think smooth but without being watery.) Freeze extras for up to three months. 3. Combine the two in a food processor or blender. Add cooking liquid or water. Blend until smooth. Freeze extras for up to three months. 1. Poach chicken for about 35 minutes. Drain and rinse thoroughly with cold water. Shred. 2. Combine chicken and 6 oz of carrots in a food processor or blender. Add cooking liquid or water and blend until your desired consistency. (Think pretty smooth without being watery.) Freeze extras for up to three months. What a great idea. Mason is a lucky guy. Wish you’d been writing this when my kids were still eating baby food! Liz — Many thanks for your sweet post! Any tips for getting kids to eat their green beans? Mason spits ’em out. Heather I love your website and am spreading the word to everyone I know.